Coworking and shared professional workspaces help promote business growth, creative thinking, shared brilliance, and collaboration through an affordable office solution. The open space concept we provide offers many advantages, from networking and collaboration opportunities, to easily accessible and shared resources. Both locations are perfect for small businesses, freelancers, remote workers, nonprofits, and other community members/groups from various professional backgrounds. People LOVE being part of our community and now if you have a private office need you can be! We’re excited to be adding an additional 4500 square feet to our campus that will include 13 offices of different sizes, 2 large conference / workshop rooms, a media room, lounge space, kitchen, outdoor seating and more. The Community hub is ideal for larger teams who might not fit in our open concept space, those in need of wellness space for businesses like a massage therapist, a counselor, and others who need private space to meet with clients. Community focused non-profits would also be an excellent fit for this new facility. All members of The Candy Factory have access to The Community Hub Campus. An amazing community and office without the overhead of a traditional office. One year commitment required on all offices, All you can drink coffee club is an extra $5.00 a month. Our Full-Time Business package is the perfect option for a small business interested in taking their business to the next level, a company looking to downsize their current office or one that would like to hire more staff but needs more space, a non-profit looking to grow their cause, a small company who wants a downtown Lancaster address but doesn’t want the hassle or overhead of their own office space. Full timers are given 24/7 secure access to our space as well as the use of the Candy factory main venue for one large private event a year. Please contact us for additional information on our Company Packages. Six Month commitment required on full-time membership, All you can drink coffee club is an extra $5.00 a month. Our Full-Time Membership is the perfect option for someone interested in taking their business to the next level, a company looking to downsize their current office or one that would like to hire more staff but needs more space, a non-profit looking to grow their cause, a small company or freelancer who wants a downtown Lancaster address but doesn’t want the hassle or overhead of their own office space. Full timers are given 24/7 secure access to our space as well as the use of the main venue for one large private event a year. A desk to call your own! Our Lite Membership is perfect for those who want to be in our space every day but don’t require a desk of their own or 24/7 access. Lite Members can use the space during open hours and can work at the Community Tables and/or the Flex Desks within the space. Use of community tables, main hall as well as all conference rooms. 3 Month commitment required, All you can drink coffee club is an extra $5.00 a month. Our Part Time Membership is ideal for professionals looking for a break from coffee shop hopping or working from home. Part Time Members have full use of the campus as well as conference rooms and can also use our address as their own. Part Time, Access for up to 16 Hours a Week, These hours are flexible and you can use how you would like. Our Community Membership is perfect for those who want to be involved in the community but don’t need full access. This membership gives you 2 Day Passes a month, a listing in our member directory as a community member, access to all member events, networks, discounts to classes, programs, Use of community tables on our coworking floors and the main hall. No mail box, printing or access to conference rooms is included in this membership. Conference room available at a discounted rental rate. Community Membership does not qualify for our company package discount. DAY PASS | Need a break from the local cafe, need business grade wifi to get that project done? Stop into Warehouse D for a day pass, no commitment and all you can drink coffee is included. You can’t beat that! Just stop in, no need to make an appointment. Please note: Day pass does not include access to the Candy Factory Member networks via Facebook and Slack, it does not include access to our conference room, printers or inclusion in events. Are You A Student? Students receive 50% off all our membership packages. Schedule a tour or email us for details. Access to our new community hub flex space, conference rooms, lactation room, wellness area. Visa Program – All members gain access to the Coworking Visa Program. This allows you to use coworking spaces all over the world for free. This is included in all memberships. Ask us for details. See the Lancaster Parking Authority website for monthly pass details. The new Queen Street garage is the closest, but Cherry Street Lot is the best deal. We also encourage car pooling, walking or riding your bike if possible. Indoor bike parking available. We have several flex parking spots for your clients and guests, 1st come 1st serve. Our cafe Perkup & Co is currebtly closed but will be reopening up inside the Candy Factory in 2019. More to come. This is a wonderful space full of great people to help keep you motivated and focused. Love everything about coworking!! I have met some awesome folks and business associates that hopefully will be lifelong friends. Great space with an upbeat vibe. Helpful crew and plenty of space to spread out and work! A well built and conceived coworking space located in the thriving and hip Lancaster, PA. Run by genuine people driven by making a difference for all kinds of entrepreneurs. Staying here in the Lancaster area for a month and needed a co-working space to work on some of my current projects. Found the Candy Factory, and could not be happier!! The atmosphere is great, everyone here is friendly and nice, plenty of room, right around the corner from PerkUp coffee 😉 and….well, 5 stars just aren’t quite enough. Thank you, Candy Factory, for letting me be part of your community for a short time. I’m looking forward to a couple more weeks of this! I always feel very welcomed with the friendly atmosphere and smiling faces. The space is unique and certainly has an area for all needs. It’s a creative and professional space to visit that is unique and unlike any office space I’ve ever been in which makes it conducive to collaboration. 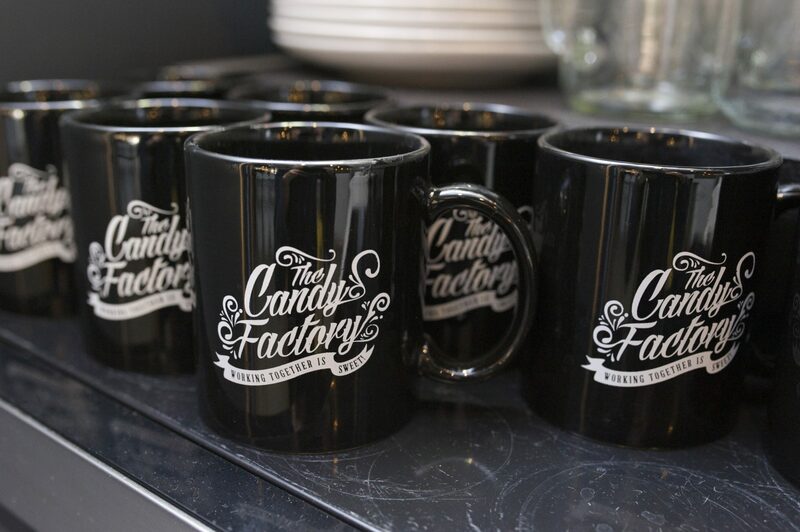 The Candy Factory is a great place to create and thrive. I joined before the renovations and I’ve felt myself grow as the building grows. There have been many great opportunities for me here.